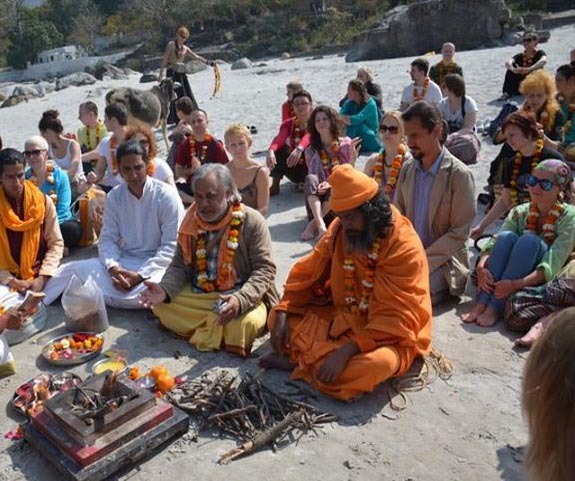 Rishikul Yogshala and continue the yogic lifestyle for a lifetime. For thousands of years, the yogis of the Himalayas observed, experimented, and fine-tuned their approach to life. And, today we reap the rewards of their dedication. We are, simply put, in pursuit of health. Full health requires a diet that nourishes and sustains us, whilst at the same time has purifying and cleansing qualities too. We offer a vegetarian yogic diet to our students that is designed to help them get the most out of their bodies and their practice. What we choose to eat in order to sustain our physical bodies is as important as how we move, bend, stretch, flex and twist in asana practice, how we breathe during pranayama exercises and how we focus in our meditation practices. Students who are exploring their physical limits in Ashtanga and Hatha asana practice need to be well nourished and hydrated, if they are to get the most out of their learning and, of course their physical practice. Yogic Diet is based on natural healing, rejuvenating and energizing elements from the revered science of Ayurveda. It is a perfect food for nourishing the mind, body and souls of budding yogis. Filtered water is always available and bottled water is for sale in the Reception area. The first tea urn of the day appears at 6 am, time to fill your mug with lemon tea or sometimes green tea and start taking in fluids to keep the physical body hydrated – not waiting for thirst to manifest. In fact, if you feel that you are thirsty, then the process of dehydration has already begun! At breakfast and all subsequent meals, the urn comes out again – when it is filled with chai(tea) there is particular merriment amongst the students. Indian masala chai, fragrant, spiced tea with milk, perfect accompaniment to the breakfasts that are on offer here. Regular tea breaks are built in with our timetable, ensuring hydration as an integral part of everyone’s daily habits. 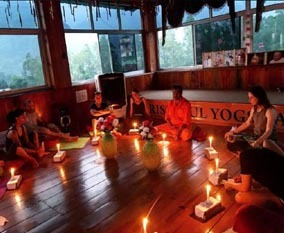 Rishikul Yogshala is a school run in accordance with yogic moral and ethical values and, certain practices are held to be very important, none more so than the practice of eating in silence. First is the Food Mantra: Before every meal, everyone gathers to put their hands together in prana mudra (palms together at the heart center) and, together chant the Meal Mantra. Chanting puts us into a sattvic frame of mind that is calm and serene and, beneficial to the act of eating. This communal act integrates mealtimes as part of the wider yogic practices and, highlights the importance of nutrition. Students are offered the chance to lead the chanting as part of their development, putting into practice straight away what is being learned. Eating in silence, hard as it is for people coming from the cultures of the west, where meals can be very much more social and talkative, is a habit that the school cares deeply about promoting. In the first place, when you talk and eat together, much more air makes it into your system. Air in the digestive system slows down digestion and can make a person feel quite uncomfortable, less air means less discomfort coupled with more efficient processing of the nutrients that have been so carefully selected and lovingly prepared. Everything is freshly prepared on site. Meals are balanced and designed to be purifying as well as energising. To achieve this, the first step is to prepare everything with love. The cooks, like the students, adhere to the teachings of the yogis, and they ensure that negative thoughts and feelings are not present during the preparation of food. Just in case, the meal mantra offers additional purification. Dishes are lovingly prepared using Ayurvedic Indian herbs and spices, such as turmeric, cinnamon, clove and cardamom. The freshest fruit and vegetables are sourced every day and, from these the culinary team prepare a plethora of dishes for every meal. The selection on offer is astonishing and every student will find a favourite or two that delight the palate. Food is delicious and aromatic while avoiding the more pungent spices that can aggravate a person’s constitution. 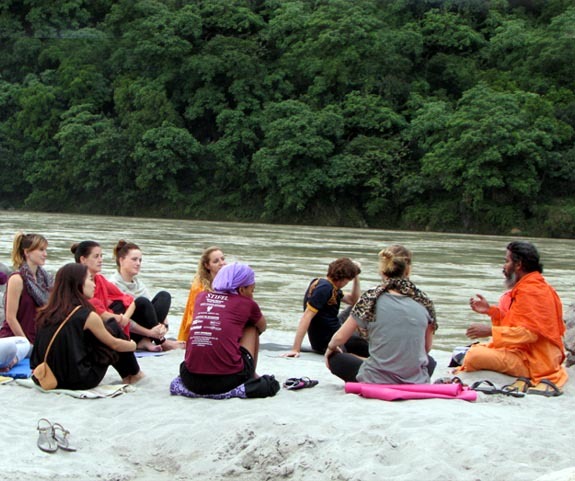 Rishikul Yogshala takes into account that many students may not be used to Indian food so the school takes care that the selection is appropriate for people from diverse backgrounds. Students with specific dietary requirements and/or allergies are catered for as a matter of course. Breakfast: Ah, breakfast. By the time the students come to break their fast, they will have completed an Ashtanga or Hatha yoga practice and taken part in a pranayama session. It is a matter of pride for those who serve the food to keep the trays full, replenishing when necessary so that everyone will get as much porridge, papaya or banana that their heart desires. Apart from fruit and porridge, there are always a couple of savoury dishes and carbohydrates on offer. The mouth shall continue to water at the thought of breakfast in the garden even after completing the course. Lunch: By lunch, the students are in need of further sustenance and the school does not disappoint. Here is a chance to sample some spectacular vegetable curries, dal(lentil) and many more savoury dishes. There is always a wide range of foods on the table, with rice and chapatis to complement the flavours. Dinner: This wonderfully balanced diet is on offer once again every dinnertime. The planning of the school menu is careful and comprehensive. Individual and collective needs are met in remarkable fashion. Indian cookery workshops are offered so that our students can take home some skills with them as well as the memory of the delicious fare that kept them learning and practicing during their time here at Rishikul Yogshala. Indulge in highly nourishing and palatable yogic food to prepare the body and mind for reaping the most out of the rigorous yoga program in India. Experience the healing and restorative magic of Ayurveda instilled food on your palate. Taste the most authentic and appetizing flavours of Yoga in India. Get introduced to the wholesome yogic food and, learn to incorporate it as an integral part of the regular lifestyle post completion of the program. I have just completed the 200hours yoga teacher training with these guys and absolutely loved every minute of it. The course was thought by people who were not only excellent teachers but also amazing human beings who share they knowledge and space with joy. A fantastic course with wonderful teachers and a mix of students from all over the globe (in the 200hr YTT course I did). In this course you receive teachings in many areas of Yoga - Asanas, Pranayama, Philosophy, Meditation, adjustment and alignment of postures, teacher methodology, Mudras, a little Mantra and even chair Yoga! (for people less mobile).